My Aunt Jean and her family were my only family in Rochester when I moved here, so I enjoyed a fair amount of Aunt Jean's cooking over the years. She was and is a good cook and tends to keep things healthy. When I saw her last, she made a simple but tasty meal of roast chicken, a winter squash dish, and a salad. In the squash dish, she substituted acorn squash for butternut by mistake (making it a labor of love to peel, seed and chop the thing), but I thought it was one of the best squash dishes I've tasted. I begged her for the recipe and here it is. I think she cut it out of the newspaper. The photo is terrible, because it's of the tiny amount that was left over the next day, just before I gobbled it up for lunch. Heat oven to 400 degrees. Mix squash, onion, oil, sugar and cumin in large bowl. Sprinkle with salt and pepper. Arrange squash mixture in single layer on a well-oiled jelly roll pan. Bake, stirring often, until fork tender and a little golden, about 30 minutes. Cut apricots into quarters with scissors. Soak in very hot water to soften, about 2 minutes. 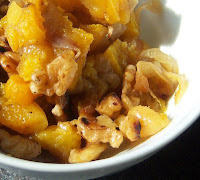 Mix the squash, apricots and walnuts in a a large bowl. If preparing in advance, add the apricots and walnuts after the squash is reheated in a hot oven. The apricots with the walnuts in the squash sounds great. I love the addition of walnuts! P.S. I made the gingerbread popcorn and OMG I can't stop eating it. I did a post today about it. Mmm, I have an acorn squash, I'll have to try this - sans walnuts, I hate them.